I am constantly on a mission to add a variety of colorful vegetables and flavors to our meals. 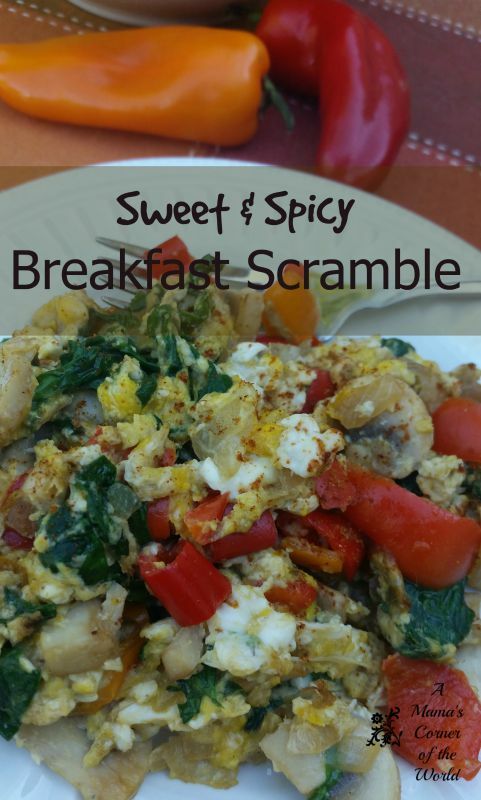 This sweet and spicy breakfast scramble is ready in minutes, holds a rainbow of colors and helps wake up the taste buds in the morning! Often, I saute the vegetables ahead of time and reheat a serving of them as I scramble in the eggs. It's a quick, easy, and healthy recipe for busy mornings! Saute the Vegetables. Heat the olive oil in a small, nonstick frying or saute pan until hot. Add the onions and peppers. Saute over medium heat for 3-4 minutes. Add the mushrooms and saute for another 3-4 minutes or until the mushrooms are tender. Toss in the spinach and continue to cook the mixture for an additional minute or so until the spinach wilts. Scramble in the Eggs. Add the beaten eggs to the vegetables, reduce heat to low and scramble the eggs--stirring and scrambling often--until the eggs are set. Season and Serve. Add salt, if desired, and a heavy dash of cayenne pepper. Since this pepper gives the scramble its spice--you can adjust this to your liking. Serve warm with fresh fruit or whole grain toast. Cook's Note: I usually quadruple this recipe and saute enough vegetables for four scrambles in advance. Then, I can pull out a serving of the vegetables and quickly scramble with eggs before work and school without needing the time to chop and prepare vegetables! The girls will split a recipe between them and my husband and I frequently pack this as a take-along breakfast to eat at our desks! We were not compensated for this post--but, we may receive slight compensation from affiliate linking within our posts. We only link to products that we have tried and would recommend in our recipes.